That Physics Show. Photo by Donnell Culver. BOTTOM LINE: Science is awesome in That Physics Show, which jams a year’s worth of physics into 90 minutes of spectacle. 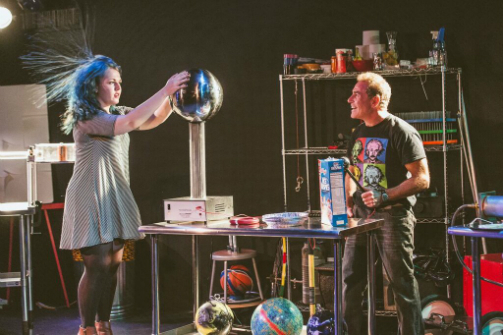 Dave Maiullo has turned a career in professional physics demonstrating into a thrilling new off Broadway show. That Physics Show purports to be “physics not magic,” but don’t think this show won’t be exciting. Over an hour and half, Maiullo takes the all-ages audience on a sightseeing tour of the coolest physics tricks he knows. As a presenter, Maiullo has charm, charisma, and very bright teeth; imagine Bill Nye from New Jersey. However, while Maiullo is mostly genial, he isn’t shy about scolding the audience for wrong answers. If middle school science was particularly traumatizing, this may bring back some painful memories. But don’t let school fool you; Maiullo’s manifesto is that physics can be fun! The show covers a huge range of physics topics, including the laws of motion, waves, electricity, and the sheer awesomeness of liquid nitrogen. This is a year’s worth of topics packed into an hour and a half. The only flaw in Maiullo’s show is the time limit. He has to choose between deep scientific explanations and neat tricks. In the interest of an entertaining show, he chooses the tricks. Maiullo explains what he can, but he tends to gloss over the fundamentals. If you are a young scientist, you might be lost when he brings up topics like inertia and electrons. Will you leave this show with a deeper understanding of physics? It’s unlikely. There just isn’t time. What the show will give you is an appreciation for the majesty of science. If you have a budding scientist in your family, this show is perfect for encouraging a career in STEM. Though the explanations leave something to be desired, the physics demonstrations are spectacular. Ever seen a Ping-Pong ball punch a hole in a beer can? How about a pickle becoming a light bulb? Did you know you can ignite balloons into a fireball? Children and adults alike will be thrilled by the tricks Maiullo pulls off. And that’s what makes this show so special. The term “family friendly” does not convey just how much fun both children and adults will have at That Physics Show. On the day I went, there were just as many adults bouncing in their seats as children. Who doesn’t get a thrill out of watching someone gleefully endanger himself in the name of science? And the best part is, you can feel smart while enjoying the spectacle! Maiullo’s production team has done a spectacular job turning this off Broadway theatre into a mad scientist’s lair, complete even with the scientist’s hapless assistant. Jordan Bunshaft is drop dead adorable as Maiullo’s constantly endangered helper. Spoiler: Jordan survives. The production value is high, supported mainly by Joan Racho-Jansen’s expert light design. Clearly, Maiullo’s team knows how to put on a show. While That Physics Show probably won’t make you any smarter, it will teach you that there might be a job cooler than a rock star. A scientist. That Physics Show is created by and featuring Dave Maiullo. Lighting Design is Joan Racho-Jansen. The cast is Dave Maiullo, Jordan Bunshaft, Kelsey Lane Dies, and Jack Herholdt.